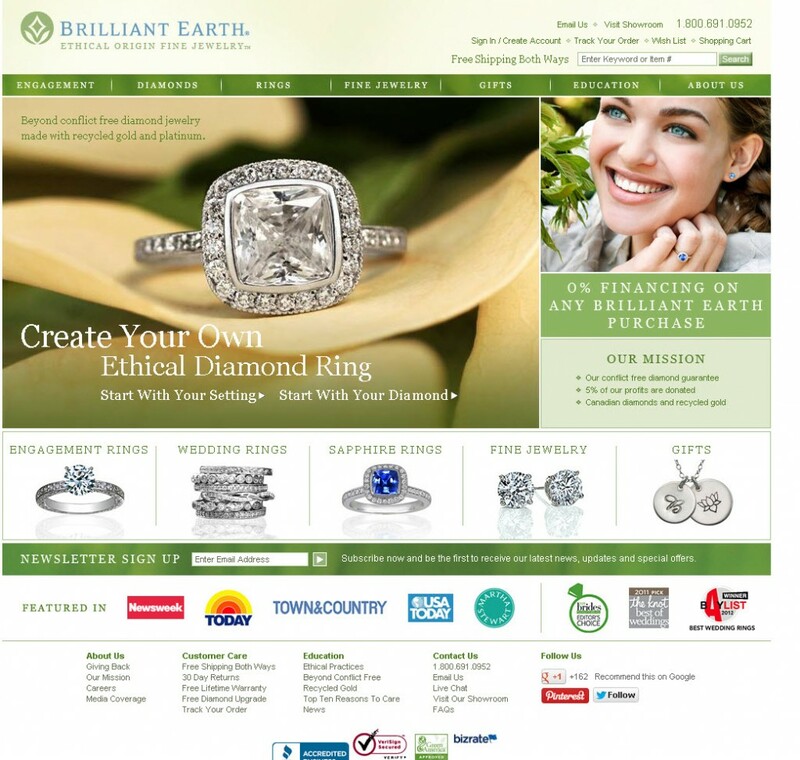 Top Web Sites for Online Jewelry Shopping | TransPacific Software Pvt. Ltd. This shopping season go for on-line jewelry shopping. On-line jewelry shopping will get your dream bespoke with a personalized touch. Web-sites are selected by weighing them on multiple criterion including user experience, yelp.com ratings, consumer complaint sites like ripoff report , BBB accreditation and most important on-line security. Zales.com is a fairly aesthetically pleasing online store that pairs up quality products with affordable prices. With an indexed website and smart features, Zales makes it easy for you to search for any piece of precious jewelry that you desire. It classifies jewelry according to different types and highlights a Clearance section for bargain hunters. 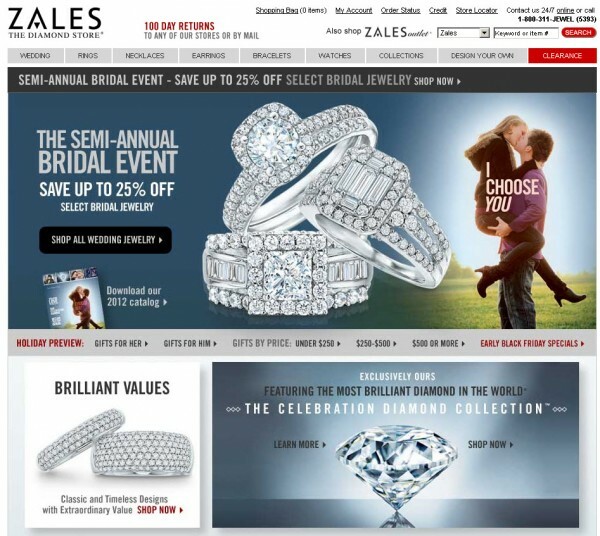 Zales.com has special categories designed for gifts for him, gifts for her and according to price ranges. You can find comprehensive wedding, bridal, engagement and anniversary collections along with a special feature to design your own ring. Coupled with detailed photos and informational material, Zales.com is a decent online jewelry store having stores in the US and Canada. Verisign Secured, 100 days return policy, Bill me Later services. Kay.com is an inviting online jewelry store that provides quick links to engagement and wedding jewelry, gold and silver jewelry, and diamonds and gemstones. With a good amount of jewelry options along with signature collections, the online version of Kay Jewelers makes shopping online a pleasurable experience. Not only does it give you the option to design personalized rings but also other pieces of jewelry. The clearance section not only draws attention with its discounted jewelry but the Previously Owned Treasures offers gently worn jewelry at amazing savings. The Kay Education Center also offers a great learning resource with regards to jewelry selection. 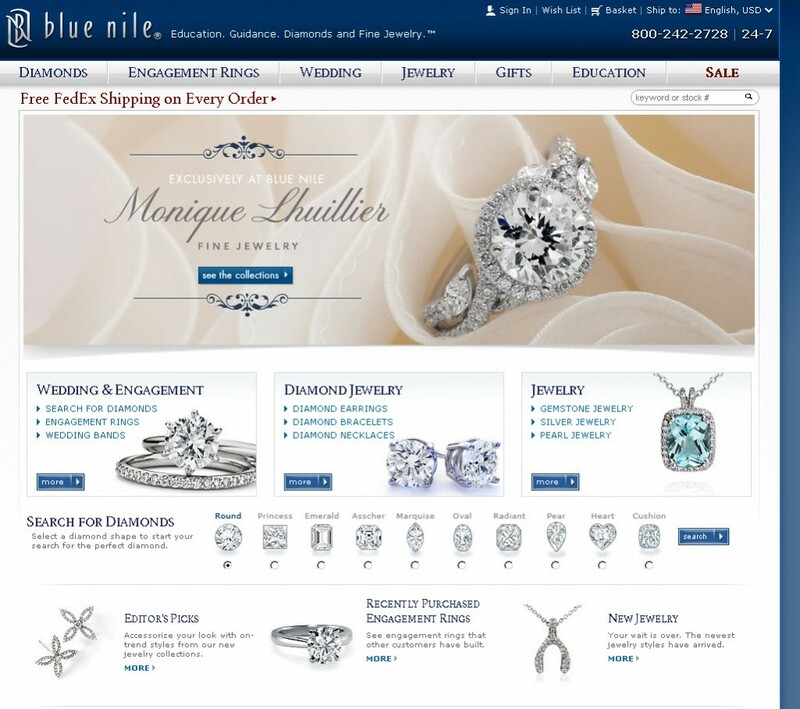 With simple color schemes and a simplified user interface, Bluenile.com is an online jewelry store worth visiting. From loose diamonds to diamond jewelry, from wedding jewelry to engagement rings, Bluenile.com offers plenty of design options and styles to choose from. The Gifts section on the site is categorized according to jewelry type, budget pieces, wedding jewelry, birthstones, anniversary jewelry, engrave-able pieces and gift certificates. Custom diamond jewelry pieces can be easily designed with specific details of the diamond outlined to aid you. 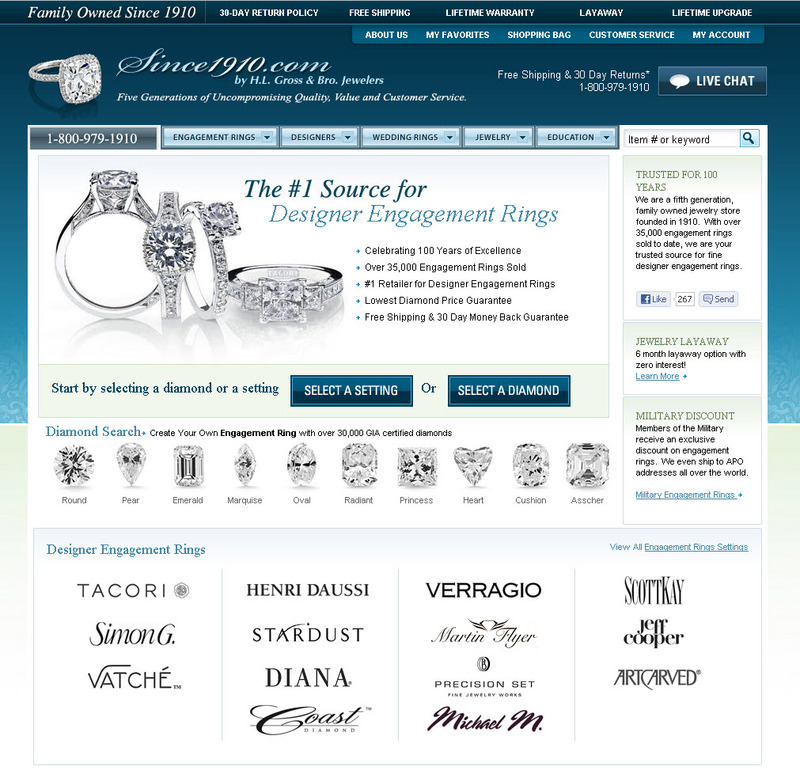 Bluenile.com offers detailed information regarding jewelry materials such as diamond, gold andothers. The site also has a special sale section that shows off all the valuable discounted pieces. Verisign Secured, BBB accredited, accepting paypal , 30-day return policy, Available as Android and Iphone Apps , Fedex delivery. With more than a 100 years of existence, Since1910 has been providing jewelry from top designers who use intricate craftsmanship to provide you with the most exquisite pieces. Since1910.com, the online store, presents a pretty wide collection of jewelry designed by themselves as well as top designer jewelry brands. The website makes the buying process uncomplicated with the accompanying jewelry information. Custom jewelry pieces can be designed according to your preferences. An interesting feature in the engagement rings section is the availability of a hand video with each ring aiding you in finding the perfect ring for yourself. Versign secured, BBB accredited, Member of : American Gem Society, GIA, Jeweler’s Vigilance Committee. Brilliantearth is an eminent online jewelry store in the UK that has brilliant collection of unique products designed according to customer jewelry preferences. The website is a sophisticated one featuring clear-cut categories to ease user navigability. You can easily filter out jewelry according to the style, price range, material, and according to gender. Brilliantearth gives you the option to build your own ring for your life’s most important occasion. Bizrate Accredited, Versign secured, BBB member. TransPacific Software specializes in consulting and developing shopping portals for Jewelry, Color stones and Diamonds. Our approach is complete end to end consultancy.